China is developing a satellite with a powerful laser for anti-submarine warfare that researchers hope will be able to pinpoint a target as far as 500 metres below the surface. It is the latest addition to the country’s expanding deep-sea surveillance programme, and aside from targeting submarines – most operate at a depth of less than 500 metres – it could also be used to collect data on the world’s oceans. Project Guanlan, meaning “watching the big waves”, was officially launched in May at the Pilot National Laboratory for Marine Science and Technology in Qingdao, Shandong. It aims to strengthen China’s surveillance activities in the world’s oceans, according to the laboratory’s website. Scientists are working on the satellite’s design at the laboratory, but its key components are being developed by more than 20 research institutes and universities across the country. Song Xiaoquan, a researcher involved in the project, said if the team can develop the satellite as planned, it will make the upper layer of the sea “more or less transparent”. “It will change almost everything,” Song said. While light dims 1,000 times faster in water than in the air, and the sun can penetrate no more than 200 metres below the ocean surface, a powerful artificial laser beam can be 1 billion times brighter than the sun. 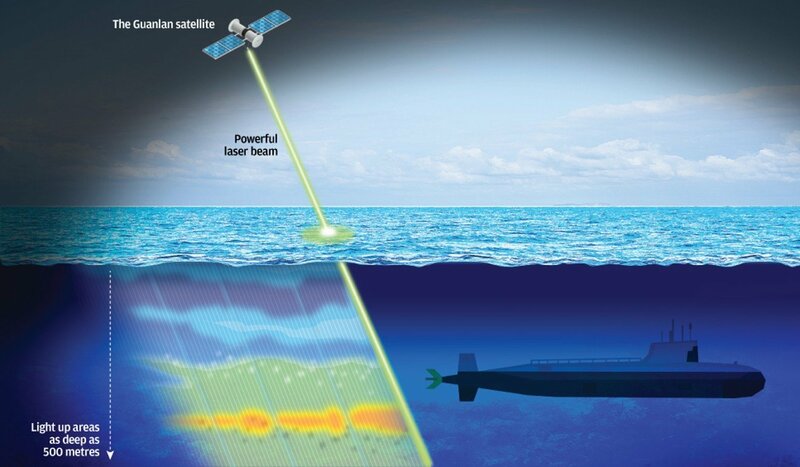 But this project is ambitious – naval researchers have tried for more than half a century to develop a laser spotlight for hunting submarines using technology known as light detection and ranging (lidar). In theory, it works like this – when a laser beam hits a submarine, some pulses bounce back. They are then picked up by sensors and analysed by computer to determine the target’s location, speed and three-dimensional shape. But in real life, lidar technology can be affected by the device’s power limitations, as well as cloud, fog, murky water – and even marine life such as fish and whales. Added to that, the laser beam deflects and scatters as it travels from one body of water to another, making it more of a challenge to get a precise calculation. Experiments carried out by the United States and former Soviet Union achieved maximum detection depths of less than 100 metres, according to openly available information. That range has been extended in recent years by the US in research funded by Nasa and the Defence Advanced Research Projects Agency (DARPA).